Rosalyn Drexler, F.B.I., 1964, acrylic and paper collage on canvas, 30 x 40". © 2016 Rosalyn Drexler / Artists Rights Society (ARS), New York and Garth Greenan Gallery, New York. 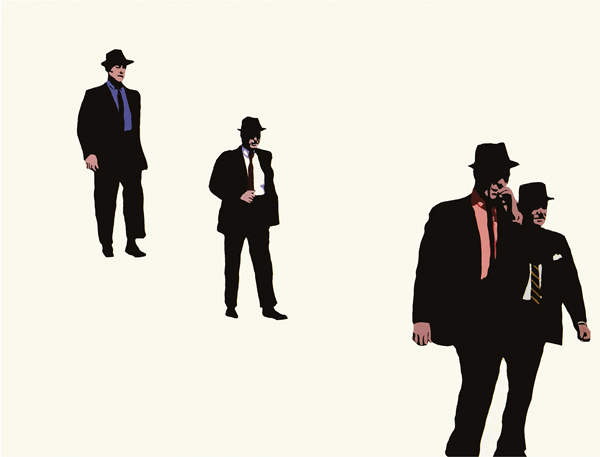 Rosalyn Drexler’s life and work appear allergic to the word dull. Over more than five decades, she has made paintings (politically electric Pop compositions incorporating collaged figures from movie poster and newspaper images isolated in bold, graphic space) and penned multiple plays, novels, and articles. She also has several Obies and a book adaptation of the film Rocky under her belt—not to mention a stint wrestling as Rosa Carlo, the Mexican Spitfire. Here, on the occasion of her retrospective at the Rose Art Museum in Waltham, Massachusetts, she discusses her exuberant love of art. The show will run from February 11 through June 5, 2016. IT’S WONDERFUL to be having a retrospective, like being a star again! Of course you also want to just run away.The show belongs to the people who created it now. It’s going to be wonderful, and then it’s going to be past, like all things. I’m going to try to be in the moment. Some of these artworks have been gone from me for fifty years. I’ve seen reproductions of them and wondered who did them, and thought, That’s pretty clever! So to see them all together will be incredible—one painting referring to another emotionally, and what was happening in my life at the time. I don’t think my paintings were seen much back in the 1960s. It was the time for Abstract Expressionism and Minimalism; Pop was just beginning to rear its huge, glittering head. My work was a secret kind of thing. I was very close to the Abstract Expressionists, and to the women I worked with when we started Women in the Arts—but no one realized I was a painter because I was writing about painting. I was happy being productive and having good friends and being ignored. But now I’m getting angry about it, looking back! I never thought about careers. I was even a wrestler for awhile. I learned how to look ominous and on top of things as I strode around the ring from corner to corner. But the truth is I hated it. I thought, Well, the experience should not be wasted—I should at least get a book out of it. I was also a waitress, cigarette girl, hatcheck, masseuse, anything to earn a living. And in between it all I was giving birth, writing books and plays, doing paintings, and going to parties. I met my husband Sherman when I was eighteen, married at nineteen, first kid when I was twenty and I was off to the races. I was married for sixty-nine years. Rosalyn Drexler discusses her show at the Rose Art Museum. Our closest friends were Franz Kline, and Bill and Elaine de Kooning, and they used up all the oxygen in the room, they were such heavy hitters. I thought painting was serious and wonderful, but I couldn’t put myself in that class. I was divided; I must have really thought of myself as a writer. My books were doing very well, getting published and critiqued. And there wasn’t a lot of interest in my painting, so I didn’t have that same kind of encouragement that I think you need. And I had no idea that what I was doing would interest anybody deeply. I never studied art. But my parents exposed me to it from an early age. A newspaper had a special: For twenty-five cents you could get art posters and books, and my mother bought me Turner seascapes, Dickens, Twain. And my father took me to a museum once and showed me a Chardin peach. I couldn’t understand how wonderful that peach was. Later, my husband would take me by the shoulders in a museum, and we would exchange ideas. I’m still painting. My husband was dying in 2014, and I was with him almost all the time, and then I would go into my studio and start a painting. He was a great critic, and I was able to share the making of these works with him. And now I have to get over the mourning, the sorrow, and I suppose that will bring a whole new kind of work. There’s a narrative thread going through all my work. It may not be seen but it’s in my head, like a kind of music. I get an idea to paint, and then I get ideas by painting. Some of the works do tell a story, but it’s not like sitting down and telling a story, or even using one word, like some artists today. I don’t use words in painting because I use words in books and articles. My love of art—an exuberance and a feeling that I wanted to do something, that I wanted to express myself—comes from when I was young. I wanted to be a writer even though I had only written one paragraph. A friend introduced me to a publisher who said, “I like what you’ve written so far, and I’m coming back in two years—give me a novel.” To start, I told myself: Just be honest, say something that means something, and amuse yourself. Well, how do you do that? So I had to find out.